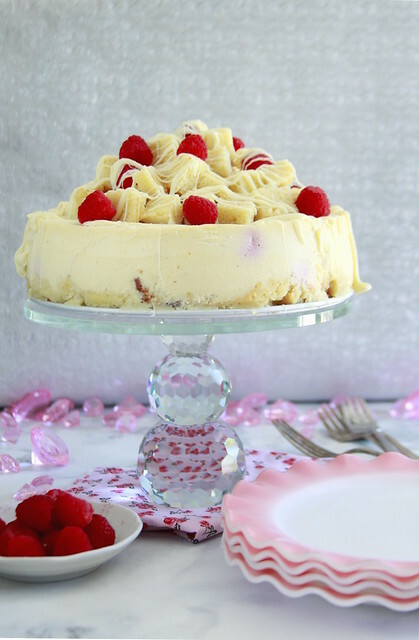 This Raspberry Charlotte Cheesecake will forever change your dessert encounters! Buttery homemade pound cakes acts as the crust to this creamy, raspberry studded, cheesecake batter. A double baking method creates two different cheesecake textures: one dense and custard-like and the other airy and delicate. 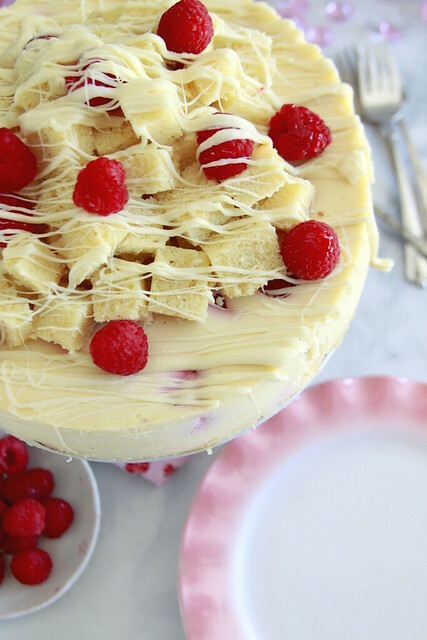 More pound cake, white chocolate, and fresh raspberries send this cheesecake into another level of decadence. In real life, it’s hard to come across people that watch television in real time. These fancy new televisions and mobile devices make television different, weird, and sort of an alone action. Yet when you do watch television, I’m watching a lot food focused programs. It may be a a faux pas, but I love watching food shows based around traveling. I had seen this Raspberry Charlotte Cheesecake featured from the Tin Roof Grill. 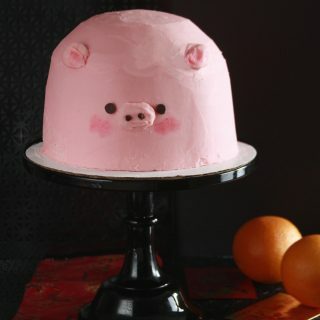 My immediate reaction to viewing the segment was—I need to bake this. I do not have the true recipe from this restaurant, but I came very close to reproducing a carbon copy. How can I convince you? 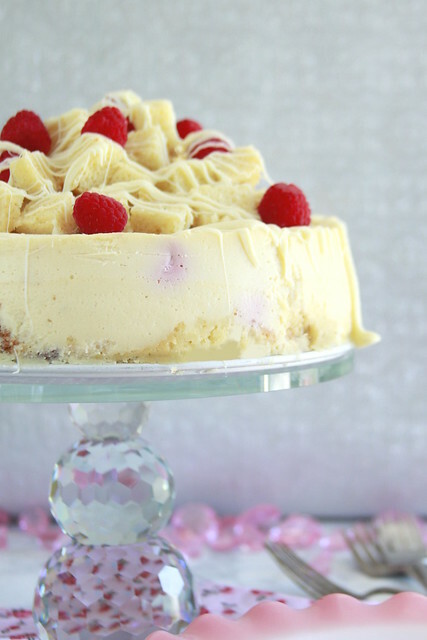 This Raspberry Charlotte Cheesecake delivers. A buttery, tender, sturdy pound cake crumb is easily consumed on its own. You may think that the pound cake would get soggy under a batter. However, this cheesecake batter has the perfect ratio of cream cheese, eggs, and sour cream to create a moist, not wet, batter. Fresh raspberries both in and on top of the Raspberry Charlotte Cheesecake contrast the creaminess of the cheesecake and crust, providing a well needed hit of awakening acidity. 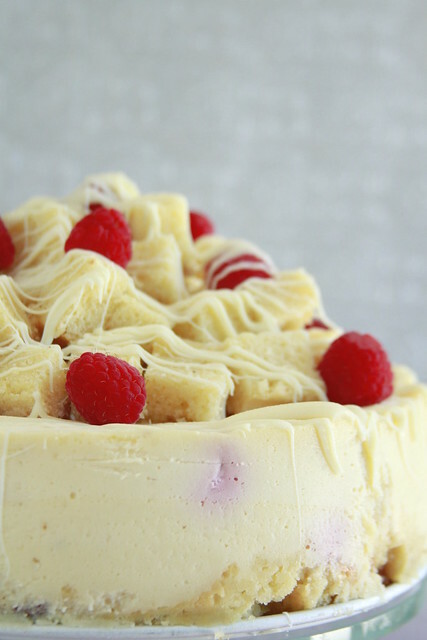 Another unique feature of the Raspberry Charlotte Cheesecake, is the double baking process. Half of the batter gets baked until mostly firm. 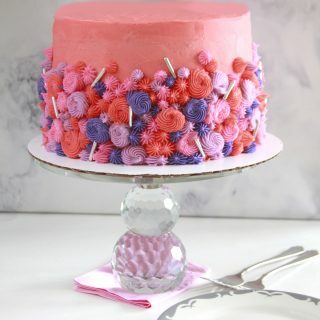 This initial baking creates a thicker textured base. The second bake is done in a water bath to produce a lighter, more delicate texture. The double baking process mirrors the result of those magic custard bars: same batter but different layers with varying mouthfeel. Regardless of you liking the show, you have to enjoy the concept—the American-ness— of traveling through food. America was meant for long meandering drives, taking the left turn, trying something only locals would eat. I won’t get into semantics of the local or authentic. But finding an innovative dessert, like this Raspberry Charlotte Cheesecake, hits all of the spots on a culinary road trip. View more of my cheesecake recipes here! The pound cake can be made in advance. It keeps for 3 days in the refrigerator or 1 month in the freezer. It is crucial that all of the dairy for the cheesecake batter be at room temperature. Preheat oven to 350 degrees F. Grease a 9-x-4-inch loaf pan with baking spray, set aside. In a stand mixer fitted with a paddle attachment, beat butter and cream cheese until smooth and combined, about 1 minute at a medium speed. Add sugar and cream mixture for 1 more minute. Beat in eggs, one at a time, beating well after each addition. Scrape the sides and bottom of the bowl down. Beat in vanilla and almond extracts. With the mixer's speed on low, gradually add dry ingredients, beating until combined. 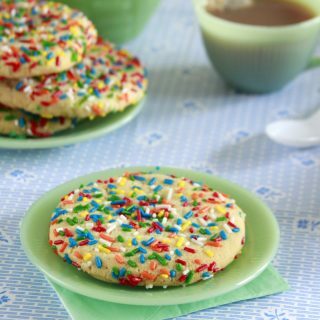 Give batter a few stirs by hand with a rubber spatula. Pour batter into prepared pan and bake for 60 to 65 minutes until golden and slightly crusty on the top. A toothpick inserted should come out mostly clean with a few moist, not wet, crumbs. 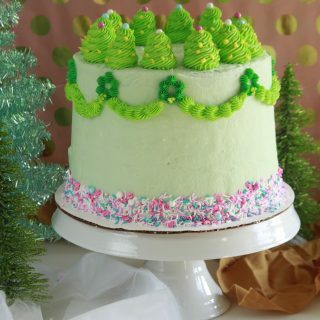 Let cake cool completely in pan. Preheat oven to 300 degrees F. Grease a 9-inch spring form pan with baking spray. Wrap the bottom and halfway-up the sides with aluminum foil. Slice ¾-rd of the cooled pound cake into ¼-inch slices. Press slices into spring form pan, filling in holes with broken up pieces of pound cake, set aside. Beat cream cheese in a stand mixer fitted with a paddle attachment, about 1 to 2 minutes at medium speed until smooth and lump free. Scrape the bowl and paddle, add sugar, and beat until incorporated, another minute at medium speed. Add sour cream, flour, and vanilla, beating to combine, about 30 seconds. With mixer of medium-low, add eggs one at a time, beating well after each addition. Again, scrape sides and bottom of the bowl down. Gently fold in the raspberries. Pour half of the batter onto the pressed pound cake bottom, banging on counter to remove bubbles. Bake, without a water bath, for 30 to 40 minutes, until it's barely set. In the meantime, prepare a pan for the water bath by boiling some hot water. Remove cheesecake, place in pan, and pour water up to ¼-inch up its side. Spread remaining batter into spring form pan and bake for a remaining 45 minutes. Turn off oven and let it rest in the oven for 1 hour. The sides should be set and the center should jiggle a little but, Refrigerate overnight to set cheesecake completely. 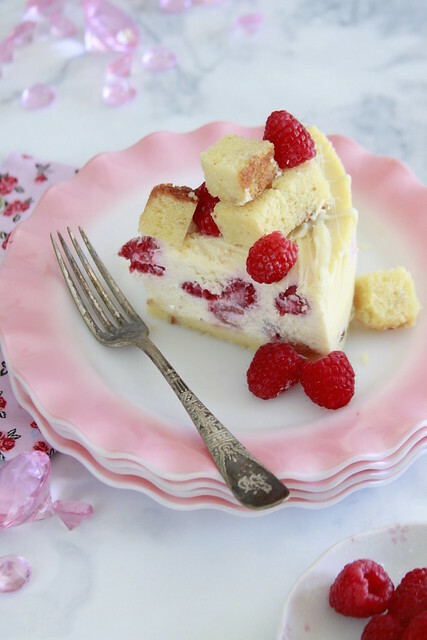 Remove cheesecake from spring form pan. 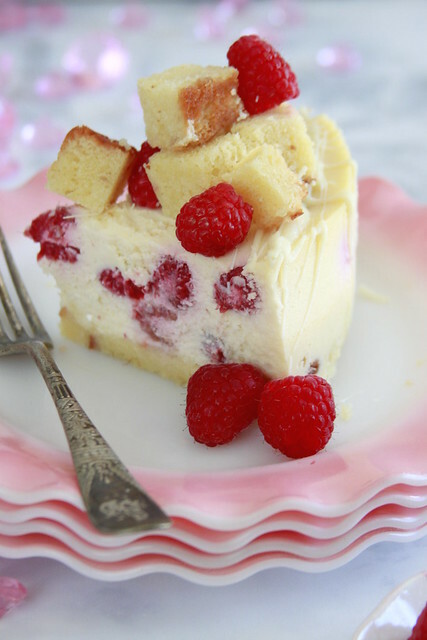 Pile on cubed pound cake and ½ of the raspberries. Drizzle white chocolate on top. Garnish with remaining fresh raspberries.